Ron Martinsen's Photography Blog: REVIEW: Lexar USB 3.0 Dual-Slot Reader–Speed up your file transfers for less than $40! REVIEW: Lexar USB 3.0 Dual-Slot Reader–Speed up your file transfers for less than $40! Generally speaking I'm not a super impatient person (stop laughing honey). When I'm ready to download my files to my computer into Lightroom I generally just stick them in my SanDisk ImageMate (pictured below) and go about my business. However, when I travel I'm generally in a hurry so the delay to wait for my cards to download from my old reader has become a problem. In fact, I realized that my cameras are a lot faster than my once "blazing fast" ImageMate, so I don’t even take it with me to travel anymore. When I was in New York recently at the Photo Plus Expo I ran into my friend DeMaris, who works at Lexar, and he flashed his pearly whites and said “I’ve got something I know you are going to like”. Now DeMaris and I had hung out at the Vancouver Olympics as our booths were next to each other at the Media Center, so I knew from that experience that when he says something like that then something cool was sure to follow. In this case it was the Lexar Professional USB 3.0 Dual-Slot Reader which he had told me about via email when it was first released. I was busy with way too many photo shoots my first couple days in New York, so it wasn’t long before I got a chance to try out this new card reader. The first thing I noticed and appreciated was that I could put the Compact Flash AND SD cards from my Canon 1D Mark IV (which uses both formats) in at the same time and both my Mac and PC would recognize it as two separate drives*. This allowed me to copy from both at the same time with very little observable dip in performance (according to Windows displayed transfer rates). On the Mac I didn’t have any numbers to look at, but what I noticed is that the files copied faster than from my camera. In fact, when I was done copying the files I tried it again from my camera, and it confirmed my suspicion – this reader was definitely faster. I tried it with both my SanDisk Extreme 60mb/sec and Lexar Professional 600x (90mb/sec) cards as well as my SanDisk 30mb/sec SD cards, and I observed an improvement. This was a huge help for me because I was dumping my cards at 2:00 AM in the morning when I needed to be up again at 6:00 AM, so speed was of the essence. I was thrilled to be able to do both formats at the same time and I was able to dump 3 CF and 2 SD cards in the time it took me to get ready for bed. That’s exactly what I needed! * = This device is inactive until you insert a card, so you’ll see one drive for each inserted card. I like this over my Image Mate which created 4 drive even if no card were inserted. As Photography expenses go, this thing is dirt cheap at < $40 (as of the time of this writing). Even if you don’t’ have a 1D Mark IV, odds are you have a point and shoot that takes SD to go with with your DSLR that (usually) takes CF cards. The dual support over a fast USB connection to a fast hard drive (critical) makes this a no brainer purchase (or a great holiday gift). However, that’s nothing new or revolutionary. What’s great about this device is its USB 3.0 support and fast transfer speed. NOTE: I found the performance was typically limited by my hard drive performance (i.e., my DroboPro was 4x faster than my slow laptop drive) with both USB 2.0 and 3.0. Copying to a super fast SSD drive is where things really get fun as you can see the real performance of this device. I also loved the small compact size (you can toss it in your pocket). I tested it with my Windows 7 64-bit Lenovo ThinkPad W510 (replaced by the W520) as well as my 17” MacBook Pro running Lion and it worked fine. Click here to learn more or to buy yours. See the sale below (limited time) to pick up some new cards while you are at it. Click here to save on Lexar cards right now. 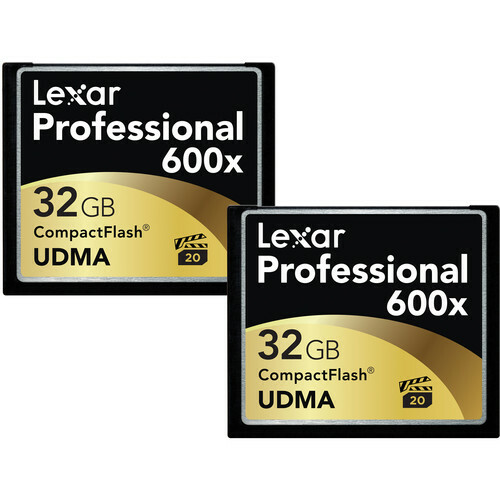 The Lexar Professional 600x (90mb/sec) is my preferred compact flash card right now, but you can get sufficient performance out of the 400x (60mb/sec) cards too. See my article entitled “Is a faster Compact Flash card worth the extra money?” to learn more. Based on my experience, cards that can do 30mb/sec or faster have been fine for HD video on my Canon 5D Mark II and 1D Mark IV. I was given a copy of this device along with a Lexar Professional 600x CF card for testing.